One short but interesting hike is the Overlook/Plant Trails. 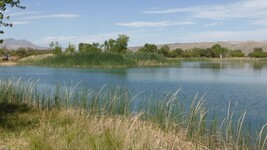 One is treated to a variety of Mojave Desert flora and the path crosses the original Wilson reservoir. Look out for birds and cottontail rabbits After leaving the ranch house and walking down the driveway to the gate, turn to the left and go up the road for a few yards and on the right one will see the trail head. This trail goes uphill at intervals and those with medical problems might not want to take this trail. 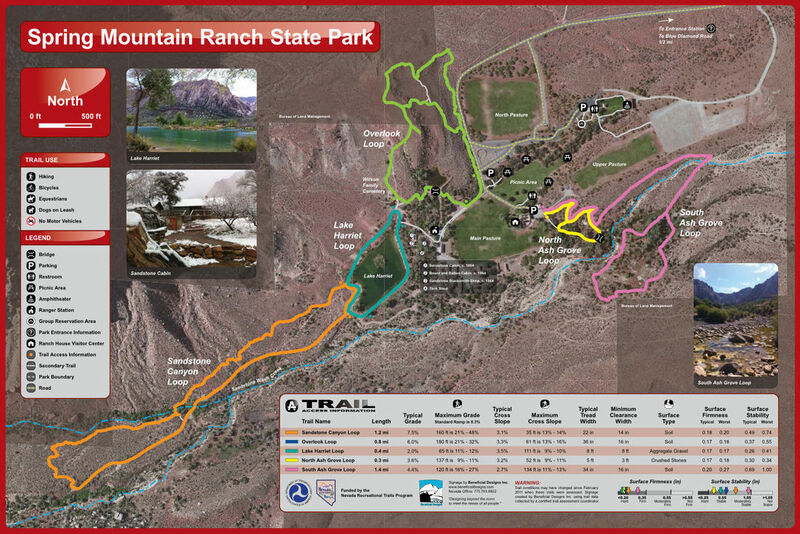 If you stay on the main road, you will arrive at the white house which is the ranger station. Continuing around the ranger station, the old blacksmith shop comes into view. Dating back to the early 1860's, this was likely used to make repairs on farming and mining equipment, and fabricate iron fixtures and implements. At first it was only a two sided structure without a roof,but later it was enclosed. The tools inside are not original, but have been donated to render a view of how the shop may have appeared. A little further up the road is the original Sandstone Cabin and to the south a board and batten additiont. This was home to the the Wilson family from 1876 to 1959 when the last of the family members included in a covenant died. This area is only accessible on the guided tour. The path then ascends to a flat area that leads to the lake. Lake Harriet is usually the end of the walk for most visitors. After circumnavigating the lake and taking in the magnificent views of the sandstone clifs and the valley, the return to the parking area is all downhill. Upon reaching the lake, a short path to the right leads to the top of the Plant Trail and the Wilson Family Cemetery. Going past the cemetery the trail goes up a steep incline to the overlook point. From this point one gets a beautiful panaoramic view of the ranch house and stunning vistas to the north and south. 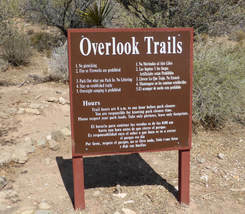 Upon leaving the overlook, the visitor can choose to backtrack to the parking lot or continue on a loop trail. At the west end of the lake, a sign is posted that marks the 1.2 mile Sandstone Canyon loop trail. This trail takes the visitor into Sandstone Canyon. Along the way appreciate the many plants and flowers and wildlife. The initial path goes up a moderate incline, but at the apex, the return path is all downhill. Finally, for those who wish to stroll among mature Ash Trees and Catclaw Acacias, the Ash Grove Trail is worth the effort. The first part of this trail leads down to a wide wash. Before crossing the wash one has the opportunity to return to the top via a looping path. For those who want the total experience, the second portion of the Ash Grove Trail takes you across the wash to a flat meadow. This path also loops back to the top. Be aware of where you cross the wash since some people get a little confused and miss the return point.